Hello everyone, its getting so close to Christmas and I’m trying to make the absolute most out of it with the Christmas posts, haha. I haven’t done a beauty related post for a while, so today I’m going to share with you two of my favourite Christmas red lip products! Enjoy. Mac Russian Red, I’m confident every single person in the world has heard of Mac Russian Red. I have featured it on my blog before, in my favourites. But now its the perfect time to really talk about this beauty. I will definitely be wearing this on Christmas day, its a darker red colour, opposed to a brighter one which I really like about this, darker reds are my favourite. Its also matte, which is perfect for Christmas day especially, eating, talking, drinking etc; its going to be staying on your lips all day long. If you don’t already own this lipstick, I think you may be missing out a bit! Tanya Burr Vampire Kiss, as everybody knows Tanya Burr has her own range of lipglosses, and this was the first one I purchased from the range. I love this colour so much, its a gorgeous red, a bit brighter than Macs Russian Red, but I don’t think I’d want any darker in a lip gloss. Everyone has probably heard/read a lot about these lipglosses, and know that they have such a good formulation and really do stay on your lips for a long time; unlike some lipglosses. This is a lovely Christmassy red anyway, one that could be worn to a Christmas party, or even on Christmas day. I must add that the smell of these lipglosses are out of this world, and its tempting to lick it off your lips, haha. 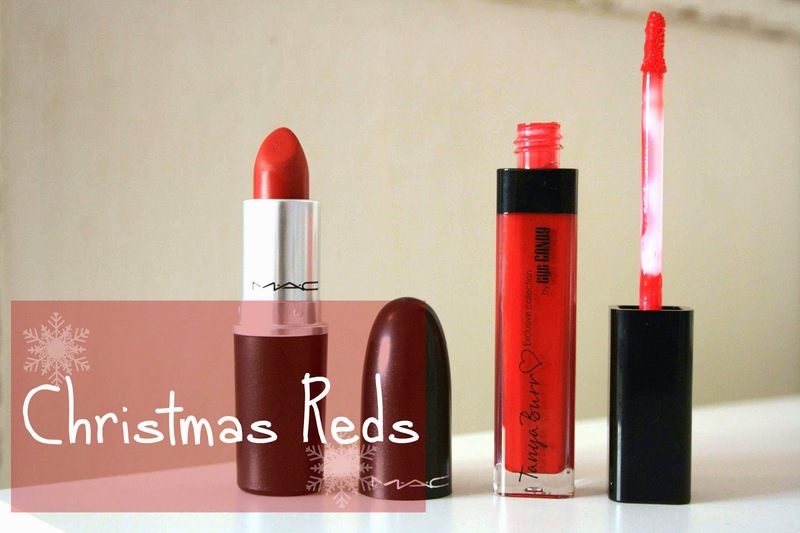 Whats your favourite Christmassy red lip product?